CHAIRMAN: Good morning. Ladies and gentlemen, may I fist of all state my sincere apologies for the significantly late start this morning which I do not intend to be a feature of further new year sittings but some exceptional matters of a preparatory nature arise this morning which simply had to be finalised before the sitting was taken up. Before inviting counsel for the Tribunal to make what I think will necessarily be a quite detailed and extended opening statement in relation to the phase of the Tribunal sittings that is now being taken up, I wish to make a number of preliminary remarks. The first and most important matter that I want to mention relates to the Tribunal’s Terms of Reference. It will be recalled that at a sitting of the Tribunal on the 24th September 1998, certain remarks were made by me for the purpose of indicating the Tribunal’s interpretation of its Terms of Reference. That interpretation was given pursuant to the then recent judgment of the Supreme Court affecting the Tribunal’s procedures. I made it clear that this was the Tribunal’s then current interpretation and that that interpretation might not be final. That interpretation was based on the information which had by that time become available to the Tribunal. It was also, to a significant degree, focused on the involvement on the part of the Tribunal with the two individuals named in its Terms of Reference, namely Mr. Charles Haughey and Mr. Michael Lowry. Since that time, an enormous amount of additional information has been made available to the Tribunal in the course of its investigative activities and in the light of that additional information and the Tribunal’s obligation, as I see it, to keep its interpretation of its Terms of Reference under review, I take the view that a further amplification of those Terms of Reference has become necessary. I had hoped to deal with these matters sometime ago but due to time taken up with the Tribunal sittings with other matters, this matter has had to be deferred. In addition, before finalising views on the Terms of Reference, it was necessary to correspond with a number of individuals likely to be affected and also to bring the matter to the attention of counsel for the public interest. I went on to say that this Term of Reference applied to any money ever held in the accounts for the benefit of or in the name of Mr. Charles Haughey and that it also applied to any money ever held in the accounts for the benefit of or in the name of a person who now holds or ever held ministerial office. Passing on to Terms of Reference (c), I stated that this Term of Reference embraced payments from accounts held in the name of or for the benefit of Mr. Charles Haughey under Term of Reference (b) to any person who holds or has held public office. Although in those two Terms of Reference, the main focus of the interpretation so far as the Ansbacher accounts themselves were concerned, was on Mr. Charles Haughey, the ambit of the inquiry so far as the Ansbacher accounts is concerned, is wider than Mr. Haughey’s involvement with those accounts. The wider ambit is clear from a close reading of Terms of Reference (b) and (c) and also from a reading of the Terms of Reference as a whole including the introductory paragraphs and the paragraphs dealing with the range of recommendations the Tribunal has been asked to make. In the light of the further information which has become available to the Tribunal concerning individuals other than Mr. Haughey, I now want to mention specifically Term of Reference (c). This Term of Reference requires the Tribunal to inquire whether any payment was made from money held in any of the accounts referred to at (b), to any person who holds or has held public office. The Tribunal takes the view that the expression ‘public office’ in the context of this Term of Reference is wider than the expression ‘ministerial office’ used elsewhere in the Terms of Reference. 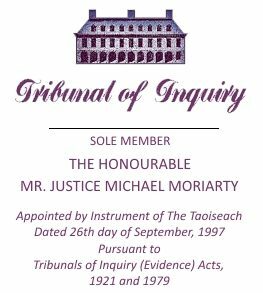 I have already alluded to the Tribunal’s view of the meaning of this term in the context of evidence already given at the Tribunal’s public sittings in connection with Mr. John Ellis, TD. Term of Reference (c) applies to payments made from ‘any of the accounts referred to at (b)’. The expression ‘any of the accounts referred to at (b)’ refers to two classes of accounts. Firstly, the Ansbacher accounts as a whole and secondly, any bank accounts discovered by the Tribunal to be for the benefit of or in the name of Mr. Haughey or for the benefit of or in the name of a connected person or for the benefit of or in the name of any company owned or controlled by Mr. Haughey. The Ansbacher accounts are referred to generically and that expression comprehends a range of accounts kept in two offshore locations, on the one hand, in the Channel Islands, all of which appeared to have been closely related and under the control of the late Mr. Desmond Traynor and on the other hand, in the Cayman Islands under the control of the late Mr. Desmond Traynor and his associates from in or about 1969 onwards. The reference in Term of Reference (i) to ‘the accounts referred to at (b)’ should be understood in the same way to refer to the two classes of accounts mentioned at (b), that is the Ansbacher accounts as a whole and any other bank accounts discovered by the Tribunal to be for the benefit or in the name of Mr. Charles Haughey and as otherwise set forth in that particular Term of Reference. Under Term of Reference (i) the ambit of the Tribunal’s inquiry embraces the source of money in, inter alia, the Ansbacher accounts for the purpose of ascertaining whether any public office holder for whose benefit money was so held in those accounts did anything in the course of his or her public office to confer any benefit on any person who was the source of that money or directed any person to do such an act. Under Term of Reference (b), an inquiry into the source of money in the Ansbacher accounts may be warranted in the case of a ministerial office holder regardless of any connection between the activities of that ministerial office holder and the person who was the source of the money. On the other hand, where Term of Reference (i) is concerned, it would not be appropriate to conduct an inquiry in public into the source of money into the Ansbacher accounts for the benefit of a non ministerial holder of public office regardless of any such connection. Under Term of Reference (i), the Tribunal envisages that evidence could not be led in public concerning the source of money held in the Ansbacher accounts for the benefit of a public office holder unless it was appropriate also to lead evidence in public as to whether that public office holder had done anything in the course of his or her public office to confer any benefit on that source of that money. That is not to say, however, that a public office holder who becomes involved with the workings of the Tribunal may not wish, in giving a good account of himself or herself, to give evidence as to the source of any such monies. Now, before concluding my remarks and it may be that I will have occasion to return to these aspects of amplification of the Terms of Reference, I note that it was stated that the Tribunal conferred in considerable depth with a number of potentially interested persons, including counsel for the public interest. I see Mr. Frank Clarke, Senior Counsel for the public interest present and as I am conscious there are particular demands on your time today, Mr. Clarke, I wonder is there any aspect you might wish to address at this juncture in regard to the Terms of Reference or otherwise? MR. CLARKE: Just very briefly, Sir, as you are aware, the remit of the public interest brief before this Tribunal includes questions concerning the Terms of Reference. As on the previous occasion when you took the opportunity to clarify your current understanding of the Terms of Reference, as you have indicated, your legal team have informed me of the substance of the clarification which you have just given in advance and also the substance of certain evidence which has come to the attention of the Tribunal and which I understand will be the subject of this phase both in the opening Mr. Coughlan is due to give and the witnesses which are intended to call. It was of course necessary to bring those second matters to my attention because as you yourself have pointed out, Sir, it is necessary for the Tribunal to consider from time to time its interpretation of the Terms of Reference in the light of the evidence then available to it. And so that I could consider the same material that you are considering, Sir, that material was brought to my attention by your legal team. I therefore had the opportunity to consider in advance the interpretation which you have just given in the light of such of the evidence as it is intended to be led in this phase as is relevant to the construction of the Terms of Reference. I also had the opportunity to consult with the Attorney General in relation to those matters. Following that consideration and consultation, Sir, I address you simply to place formally on the record my full agreement with the interpretation which you have just announced and there are no other matters I think which require any intervention from the public interest at this stage. CHAIRMAN: Thank you very much, Mr. Clarke, for that. The only other matter before inviting Mr. Coughlan to make his opening remarks that arises simply relates to the mechanics of tomorrow’s hearing, although I am extremely anxious that we expedite this phase of the inquiry as far as possible, a somewhat exceptional circumstance has arisen tomorrow in that the ordinary sittings of the High and Supreme Court are being suspended to allow for a particular ceremony at 12 o’clock in the Supreme Court to mark the retirement of the Chief Justice of Ireland, Mr. Justice Liam Hamilton, after over twenty-five years service in the Supreme and High Courts. All Supreme and High Court judges have been asked to attend and to accommodate this, whilst seeking to make the best progress we can, what I would propose for testimony tomorrow is that we make a somewhat early start at ten o’clock, adjourn at or very shortly after half eleven, resume at 2:15 and seek perhaps to make up such lost time as may have arisen today or through tomorrow’s somewhat truncated morning sitting as best we can. I hope neither this nor the late start this morning has caused anybody attending undue inconvenience. Before inviting Mr. Coughlan to take up his opening remarks, are there any other matters that arise that require to be raised at this stage? Very good. Mr. Coughlan? The Ansbacher accounts play a significant role in a number of aspects of the Terms of Reference. The Terms of Reference are not devoted exclusively to the Ansbacher accounts in as much as they appear to have no connection with the Terms of Reference relating to Mr. Michael Lowry. From time to time the Tribunal, in outline statements, has indicated that, in due course, a comprehensive account of the operation of those accounts would be dealt with at one of the sittings of the Tribunal. This, the Tribunal intends to do in the course of this sitting. There are a number of other matters which will also be mentioned in the course of the sitting. Overall, the sittings will deal mainly with Terms of Reference (a), (b) and (c). In the course of both the investigatory work it has been carrying out and in the course of its public sittings, the Tribunal has formed a picture of the main features of the operation of what have come to be known as the Ansbacher accounts and also of the style or manner of operation of these accounts. In referring to the Ansbacher accounts, I mean to include all of the offshore operations carried on by the late Mr. Desmond Traynor and his associates. These were conducted not only in the Cayman Islands but to some degree also in the Channel Islands and both of these operations were closely connected. These sittings, so far as Term of Reference (a) are concerned, will deal with the operation of the Ansbacher accounts to the extent to which they throw light on or raise queries warranting further investigation concerning the circumstances in which payments were made directly or indirectly to Mr. Charles Haughey and in particular, whether those circumstances gave rise to a reasonable inference that the motive for making the payments was connected with any public office held by Mr. Haughey or had the potential to influence the discharge of such office. It is not envisaged that in the course of these sittings, evidence will be given concerning specific payments in the context of Term of Reference (a), nor will evidence be given concerning the circumstances surrounding any specific payments as such. There may be reference to evidence already given concerning such specific payments or what would appear, subject to the conclusions of the Tribunal, to be substantial payments within Term of Reference (a). What is contemplated is that evidence will be given concerning the overall operation of the Ansbacher accounts. Where Term of Reference (b) and (c) are concerned, the Tribunal will be dealing with individuals other than Mr. Haughey who have had dealings with the Ansbacher accounts. The dealings of these individuals with the Ansbacher accounts may be of some relevance in enabling the Tribunal to form an overall picture of the accounts. It is important to bear in mind, however, that so far as the information available to the Tribunal is concerned, there would appear to be no suggestion of any substantial payment to any of these individuals in the context of Term of Reference (a) and, as will appear later on, the Tribunal has obtained considerable assistance from them in endeavouring to establish a full picture of their involvement with or dealing with the Ansbacher accounts. Turning now to the development of the Ansbacher operation. A large amount of information has come into the public domain concerning the development of the Ansbacher accounts in the course of the evidence given to McCracken Tribunal and also from the report and findings of that Tribunal. It is inevitable that in the course of outlining the operation of the Ansbacher accounts in this Inquiry, there is going to be a degree of repetition. However, as the report of the McCracken Tribunal clearly acknowledges, the information available to that Tribunal in carrying out its inquiry was relatively limited. At the same time, even with further information made available to the Tribunal, it is unlikely that it will ever prove possible to obtain a wholly comprehensive account of the Ansbacher operation. This is because obtaining information from the Cayman Islands has proved very difficult. The McCracken Tribunal was unsuccessful in litigation on the island in endeavouring to obtain information. This Tribunal has been in correspondence with the entities which formed part at one time or another of the Ansbacher operation. The response of those entities to the requests from the Tribunal for assistance has proved to be unhelpful and, in some cases, more than unhelpful. The manner in which some of the entities forming part of the Ansbacher operation and in particular the entity known as Hamilton Ross, have responded to requests for assistance and cooperation, forms part of the picture of these accounts. It is a feature of the Ansbacher operation as it evolved over the years from the early 1970s up to the late 1990s that it became characteristically more secretive until a point has now been reached where people who dealt with the agents of the operation find that, notwithstanding their express direction to those agents, in this case Hamilton Ross, and notwithstanding an express authority to Hamilton Ross to provide information to the Tribunal, the response has been wholly obstructive. Whether this is a feature of banking operations in the Cayman Islands is not clear and is something which may require further elucidation, in other words, it is a question whether this is a characteristic of the Hamilton Ross operation or a characteristic of Cayman banking operations in general. In seeking to build up a picture of these accounts, the Tribunal has been provided with considerable assistance by Guinness & Mahon and by Irish Intercontinental Bank. These were in the main the two banking entities in this jurisdiction through which the late Mr. Desmond Traynor operated the Ansbacher operation. The Tribunal has also sought and has obtained assistance from a number of former employees of Guinness & Mahon. They include Mr. Padraig Collery from whom evidence has already been given concerning a number of specific transactions on these accounts. The Tribunal, in the course of its work, has identified a number of individuals who became clients of Mr. Desmond Traynor or of the Ansbacher operation and from these individuals has also obtained a considerable amount of assistance. From information made available to the Tribunal by Guinness & Mahon and by a number of former employees of that bank, it would appear that from in or about 1969, Guinness & Mahon became involved in offshore finance and/or offshore banking initially in the Cayman Islands and at a slightly later date in the Channel Islands. The history of the establishment of Guinness Mahon Cayman Trust as a bank with initially a B licence in 1971, and subsequently a full banking licence in 1974, has been outlined in the report of the McCracken Tribunal. Guinness Mahon Cayman Trust, whether as initially established with a B licence, or as a full bank with an A licence, was a wholly owned subsidiary of Guinness & Mahon in Dublin. Guinness Mahon Cayman Trust placed funds in Dublin and, it would appear, in London. In or around 1972, Guinness & Mahon in Dublin developed a Channel Islands business, initially in the form of Guinness Mahon Jersey Trust. This too was a wholly owned subsidiary of Dublin. In 1973, another Guinness Mahon business was established in the Channel Islands, in this case in Guernsey. This was Guinness Mahon Channel Islands. Guinness Mahon Jersey Trust Limited was not set up as a bank but as a trust company. It was envisaged that Guinness Mahon Channel Islands would be set up as a bank and it appears that a banking licence was obtained. However, due to changes in the economic climate, it would seem that Guinness Mahon allowed the licence to be surrendered or to lapse or gave it up. In or around 1975, a trust company was set up in Guernsey. This was College Trustees Limited. It was formed as a wholly owned subsidiary of Guinness Mahon Channel Islands. As in the case of the Cayman business, the Channel Islands businesses placed monies on deposit with Guinness & Mahon in Dublin. It would appear that the initial impetus to establish both the Cayman and the Channel Island businesses was the potential to attract funds from Ireland or from Irish residents. Mr. Desmond Traynor was the Dublin Guinness & Mahon executive most actively involved in the establishment and in the operation of these offshore businesses. Both the Channel Islands and the Cayman operations involved also Mr. John Collins and Mr. John Furze, both of whom have already been mentioned in the McCracken Report. While it seemed initially that College Trustees was the main entity by which the Channel Islands funds were placed, either directly or through Guinness Mahon Channel Islands or Guinness & Mahon in Dublin, it would appear that at some stage, though the precise circumstances are not clear, a portion, perhaps a considerable portion, of the Channel Islands funds under the control of Guinness & Mahon subsidiaries was transferred to or came under the control of the Cayman subsidiary. Although the offshore operations of Guinness & Mahon were set up so that they could be marketed to Irish residents, it seems clear that to some degree at least the services were availed of by non Irish residents and indeed after Cayman had become well established, its customer base expanded to the point where at one time it appears to have had a significant US customer base. Some of the initial funds used to set up the offshore operations and, in particular, the Channel Islands offshore operation came from trust with which Guinness & Mahon in Dublin had been dealing. Some of these trusts were Irish based and some were English based. However, the dominant feature of the operation was that Irish funds or Irish related funds were placed offshore through Guinness & Mahon, and as far as the Tribunal has been able to ascertain, through Mr. Desmond Traynor and associates of his in Guinness & Mahon, and at a later stage outside of Guinness & Mahon. In the main, trust vehicles were used in the placing of these funds offshore. Trust vehicles were not used in every case and with the evolution of the offshore activities under the control of Mr. Desmond Traynor, a significant amount of activity appears to have occurred otherwise than through trust vehicles. Firstly, that notwithstanding that the funds purported to be under the control of discretionary trustees, certain individuals appear to have had ready access to the funds on application to Guinness & Mahon in Dublin. Secondly, transactions involving the transfer of funds to the trusts appear in some cases to have been carried out in such a way as to avoid exchange control. Thirdly, the trusts were at all times operated with a degree of secrecy and that as the operation evolved, the degree of secrecy also evolved to the point where eventually a significant part of the business was conducted under the cloak of what would appear to be a highly irregular operation carried on in part from Guinness & Mahon and in part from other locations in Dublin. Whether the secrecy with which these operations were cloaked was designed to avoid scrutiny of the trust device or of the manner in which the funds initially settled on the trusts were accumulated is not clear. It will become clear, however, from the documents to which I will refer to later on, that the directors of the Cayman operation were particularly conscious that they were depending on a market for funds, a significant portion of which they hoped to attract from individuals seeking to evade tax, apart altogether from the fact that they were also undoubtedly seeking to attract funds from individuals seeking or if not seeking, at least aspiring to, avoid tax on a legitimate basis. These accounts were operated to the initial stages on the books of Guinness & Mahon, at least so far as the Channel Island funds were concerned. The accounts in question were recorded as lodgments from Guinness Mahon Jersey Trust or Guinness Mahon Channel Islands and each account was identified by reference to the name of a company or the trust with which it was associated. In time, and because, it would appear, of Mr. Traynor’s desire for greater secrecy, letter codes or number codes were applied to the accounts. Some of these letter codes were relatively less opaque than others. In some cases, they referred merely to the initials of an individual by whom funds had been provided for deposit offshore. In other cases, they referred to letters which appeared to have had no connection with the identity of the person by whom funds were placed on trust offshore. Where Cayman Islands accounts are concerned, the position is less clear, as it seems that, from a very early date, most of the funds placed on deposit by or through the Cayman offshore entities were placed in pooled accounts. In that way, any addition to a particular fund or a particular fund holder’s balance would not be reflected in an individual Cayman account but rather as a credit or debit to the entire account. Anyone examining the books of Guinness & Mahon in Dublin therefore would become aware of the individual balances on specific Channel Island accounts so that a Guinness Mahon Channel Island designated GMCI “A” account, for example, pertaining to a specific trust or a specific individual placing his funds on deposit through an offshore entity would be visible on an inspection of the accounts. An inspection of the main Cayman accounts would give no clue nor could it give a clue as to the identity or coded reference of any person entitled to any part or entitled to a claim on any part of any such account. It seems that, with the passage of time, most of the Channel Island monies referable to Mr. Traynor were transferred to Cayman. Lodgments to these accounts and withdrawals from these accounts could be made in Dublin in a number of different ways. In every case the identity of the person by whom lodgments were made would generally be obscured and likewise, the identity of the persons to whom withdrawals were paid would also be obscured. This would be done to the case of cash withdrawals by arranging for the payment in Dublin to couriers from the Channel Islands of large sums of money. As many of these withdrawals were in Irish funds, it would appear reasonable to conclude that they were intended for onward transmission to persons within this jurisdiction. The Tribunal can conceive of no reason why these withdrawals could not have been made by way of payments to the form of cheque payments out of the offshore accounts or by way of transfer to other accounts but for the fact that they would be likely to draw attention to the identities of the individuals involved. A feature of the accounts which has been mentioned from time to time is the provision of lending facilities on a back-to-back basis. In the course of evidence given to McCracken Tribunal, reference was made to a Celtic Helicopters loan which was apparently secured by personal guarantees from Mr. Ciaran Haughey and Mr. John Barnicle. These personal guarantees were however in turn secured or backed by a deposit taken from the Ansbacher Cayman Limited main or general account with Guinness & Mahon. A similar backing arrangement was used to secure a loan of £150,000 from Irish Intercontinental Bank to Celtic Helicopters in 1991. This Tribunal took the view that it was likely that this method of providing security using Ansbacher accounts would lead the Tribunal to information concerning the operation of these accounts and, further, it would lead the Tribunal to identify individuals involved in the operation of accounts who would be able to be of assistance in providing evidence concerning their operation. The provision of security in this way using Ansbacher or Channel Island deposits to secure borrowings by Irish residents involved a considerable degree of secrecy over and above that appertaining to the Ansbacher accounts themselves. As the McCracken Report shows, this type of security was provided both during the period in which these deposits remained at Guinness & Mahon and during which they were placed with Irish Intercontinental Bank. The degree of secrecy was however much greater in Guinness & Mahon and this appears to be due to the extent Mr. Traynor was able to control all aspects of the activities of that bank and all aspects of any dealings with the bank which involved Channel Island for Cayman Island accounts. This secrecy was characterised by the way in which back-to-back secured borrowings was recorded in the bank’s Credit Committee minutes or in the internal memoranda concerning the borrowings and, in addition, in the facility letters issued to clients recording the condition or the basis of any borrowings secured by these deposits. In Guinness & Mahon, it appears that in the 1970, whenever borrowing by an Irish resident was secured by an offshore deposit, this type of security was not referred to in the facility letter sent to the borrower. The bank’s credit memoranda described this security by a coded expression, usually “suitably secured” or some similar expression. Sometimes the word “secured” was used and even the word “unsecured” was used. We will go back to the first document, how it was recorded. There’s example in parenthesis, “suitably secured” and then the next document, yes, another example is “considered adequate on unsecured basis”; another example is “secured” in parenthesis and as that example on the screen indicates also in parenthesis, “unsecured” was used on occasion. The Tribunal has been informed that the use of this expression in the bank’s internal credit documentation indicated that borrowing was secured by a blocked Ansbacher deposit. In other words, either a particular deposit or more usually, part of a large pooled Ansbacher deposit would be blocked or hypothecated as security by borrowing for the Irish resident. It would appear that the acknowledgment that any borrowing might be secured in this way could only be given by the late Mr. Desmond Traynor. An acknowledgment or undertaking by Mr. Traynor that borrowing was secured in this way would be given informally. This was undoubtedly on irregular manner in which to conduct the business at the bank. It has certainly left open to question whether in describing the security in this coded way, Mr. Traynor was seeking to conceal a relationship between a borrower and an offshore deposit. It is almost certainly the case that where the depositor and the borrower were both Irish residents, (and this was more often than not, though not invariably the case), the borrower would be entitled, depending on the provisions of the Finance Acts from time to time, to write off either against income, or particular income, or against any profits or particular profits, the cost of the borrowing. Assuming that the borrower was also the person either with control over or the person beneficially entitled to the deposit offshore, then as long as the existence of the deposit was not disclosed, he had an opportunity to enjoy the accrual of interest on any such deposit without accounting for it to the Revenue Commissioners. In this way, a person might enjoy the benefit of tax relief on the borrowing and in addition, untaxed income from the deposit. These arrangements, which appear at best to be unorthodox and at worst irregular, appear to have come to the attention and have been the cause of some concern to the bank’s auditors. I should say when I refer to the bank there, it’s the Guinness & Mahon auditors. The Tribunal has however been informed that whenever the auditors queried either the absence of security or the nature of such security, they were always referred to the late Mr. Desmond Traynor and that the true nature of the security was then explained by Mr. Traynor but in terms that it could not be disclosed in the bank’s records. The Tribunal envisages that, in due course, the response of the auditors may be examined but it is clear that by 1986, and subsequently, the auditors had expressed concern to the point where the bank’s parent, Guinness Mahon & Company of London, sought explanations and effectively began to insist on the unwinding of the entire Desmond Traynor/Ansbacher operation. In addition to attracting the attention of the auditors, it would seem that aspects of the Ansbacher operation also attracted the attention of the Central Bank of Ireland. From information made available by the Central Bank, it would appear that there was an exchange of correspondence between the Central Bank and Guinness & Mahon in 1976 and 1978 in connection with issues which arose in the course of on site inspections by Central Bank officials. That correspondence no longer appears to be on the records of Guinness & Mahon. However, with the consent and the cooperation of Guinness & Mahon and of the Central Bank, the Central Bank was released from its statutory obligation of confidentiality concerning such documentation and the letters involved have now been furnished to the Tribunal. It would appear that in 1976, the then Governor of the Central Bank writing to the Chairman of Guinness & Mahon following an on site inspection by Central Bank staff, indicated that the inspection had revealed that Guinness & Mahon had banking subsidiaries operating in offshore tax havens and that the Central Bank was concerned at the extent of Guinness & Mahon’s involvement in this activity. As that text indicates, the Central Bank indicated it would welcome an opportunity to discuss the matter with Guinness & Mahon and while the Tribunal has not yet been able to ascertain what yet transpired in the course of any such discussions, it has been furnished with a letter of the 26th November 1976 from Mr. John Guinness, the then chairman of Guinness & Mahon, to the Governor of the Central Bank in response to his concerns. Mr. Guinness stated that he was not happy with the bank’s understanding of his situation and that he too would welcome an opportunity of discussing the matter. The Central Bank indicated that it would appreciate any comment Guinness & Mahon might wish to make in response to that concern. “We do have a wholly owned subsidiary Guinness Mahon Cayman Trust Limited and we do transact business of a banking nature with Guinness Mahon & Company Limited and with its wholly owned banking subsidiary. Such business however is a normal part of the activities of a bank which is part of an international banking group and to the best of my knowledge, the major Irish banks have similar structures. My board feel strongly that we are not involved in what you have described as “offshore banking activities” but on the other hand, they recognise that confusion sometimes can occur in regard to the exact nature and purpose of banking business emanating from these international contacts. At that stage, Mr. Traynor and Mr. O’Kelly were the joint managing directors of the bank. As of yet, the Tribunal has not been able to ascertain whether any such meeting took place and, if so, what transpired at any such meeting. However, the Tribunal has been informed by a former official of Guinness & Mahon that as in the case of any queries raised by the bank’s own auditors concerning these arrangement, queries from the Central Bank inspectors were referred to Mr. Desmond Traynor, that Mr. Traynor informed the Central Bank of the nature of the deposit but that in so informing the Central Bank inspectors of the nature of the deposits, he made it clear that he was relying on their statutory obligations of confidentiality and secrecy, so as to ensure that any suspicions they might have concerning the true nature of the deposits were not brought to the attention of any other state agency. Whether or not there was any formal outcome of the correspondence or of any meeting which may have taken place following the correspondence already mentioned, it would appear that the use of the coded expression “suitably secured” ceased sometime in or around 1979 at least for a short period of time. However by 1983 the expression was again being used, this time in a slightly different form most usually in the form of the words “adequately secured” or “security considered adequate” . The Tribunal has also been informed by Guinness & Mahon that it would appear that the provision of the borrowing facilities on the back-to-back basis which I have just mentioned continued during the period between 1979 and 1983 when the expression “suitably secured” was dispensed with but that during that period, other steps were taken to avoid scrutiny by outside agencies of any such arrangements. The Bureau System used to record and administer the Ansbacher accounts has already been mentioned in the McCracken Report. The existence of the bureau system appears to have been known to many members of the Guinness & Mahon bank staff and as far as the Tribunal has been able to ascertain, was also known to many senior executives. Access to the system was, however, limited to a small number of members of the bank staff. It would seem that in the early days of the Ansbacher operation, the keeping of accounts on a manual bureau system was deputed to the late Mr. Ru Leonard, an official of the bank and officials of the bank who reported to him. At one point, one of those officials was Mr. Padraig Collery. In time, Mr. Padraig Collery graduated to a more senior position in the bank and took over the operation of the bureau system, initially the manual recording of entries on the system and subsequently the computerisaion of the system. After Mr. Collery took over responsibility for the system, he supervised the inputting of information on the computer programme on which the system was operated. There were a number of members of the staff at Guinness & Mahon involved in carrying out this computer work under Mr. Collery’s supervision. This work, which annually would take up in the aggregate approximately a fortnight of the staff members’ time, was done on Guinness & Mahon time and the staff members involved were given no extra remuneration by Guinness & Mahon or anyone else for such work. Nor would it appear at that time that Mr. Collery was given any additional remuneration for such work during his time with Guinness & Mahon. As long as Mr. Desmond Traynor was a Director of and Joint Managing Director of Guinness & Mahon, he was in a position to give instructions to Mr. Collery concerning the operation of the bureau system, and effectively the activities of the Ansbacher operation, by way of internal memoranda in Guinness & Mahon. In 1986, however, Mr. Traynor resigned from the bank but following his resignation worked initially from offices nearby in Trinity Street and subsequently in 1987, upon his appointment to the chairmanship of Cement Roadstone Holdings from offices at Lower Pembroke Street. After he left the bank, the administering of the bureau system was no longer as convenient for Mr. Traynor as it had been while he could direct affairs by the use of internal memoranda within the bank. It now became necessary for him to give instructions to Mr. Collery from an outside location. This was still done by way of memoranda, this time from Lower Pembroke Street as opposed to within Guinness & Mahon premises itself. It would appear that many officials of the bank, including many of the senior executives, were aware of the continued existence and operation of the Ansbacher business within the Guinness & Mahon premises by way of outside instructions from Mr. Traynor. The Tribunal has been informed by Guinness & Mahon that it would also appear that many of the directors of the Dublin bank were aware of the existence of these activities both during Mr. Traynor’s association with the bank and even after he left. After the late Mr. Desmond Traynor took up his position as chairman of Cement Roadstone Holdings, he was provided with office premises and office facilities at the Head Office of the company initially at Lower Pembroke Street and subsequently at 42 Fitzwilliam Square. After the departure of Mr. Padraig Collery from Guinness & Mahon in 1989 and until the death of Mr. Traynor in 1994, the entire day-to-day administration of the Ansbacher operation in this country was conducted at the premises of Cement Roadstone Holdings Limited. The bureau system of computer information was kept on the premises and the keeping of records and input of information was carried out by Mr. Padraig Collery to that premises on a weekly basis, usually on a Saturday. This would involve the assembly of various memoranda and other documentary material generated in the course of the week by Mr. Traynor or by his secretary, Ms. Joan Williams, in connection with the activities of the Ansbacher operation and the entry of various transactions, debits and credits across the numerous coded accounts kept on the computer system. The records kept on the Cement Roadstone premises were not purely in computerised form. There was also a significant amount of documentary information on files kept by Mr. Traynor and his secretary, Ms. Joan Williams. This information accumulated over a period of time and by 1994, filled several filing cabinets. However, notwithstanding that a significant amount of paper records were kept by the late Mr. Desmond Traynor, it would appear that bank statements in the ordinary way were not issued on a regular basis to persons entitled to or who had lodged funds to the Ansbacher operation. Information concerning balances would apparently be provided on request to Mr. Traynor, whether it was by telephone or in written form. There was no long-term record of the state of any individual’s balance and in general it would appear that the state of a balance was not kept in paper form for more than a short period of time. This was with a view to minimizing the paper record and in general, minimizing the potential for scrutiny of the state of balances on the Ansbacher operation. Where statements were issued, they were usually in the form of an ordinary bank statement containing the dates or the proximate dates of credits or debits and any other relevant particulars. What distinguished these statements from ordinary bank statements was the fact that in general the identity of the bank, in this case Ansbacher Cayman, did not appear on the face of the statement. The Tribunal has been informed that in fact ordinary Ansbacher account statements would be used but the name of the bank, together with the account information, account number and so forth, would be removed by cutting the upper portion of every relevant page. For the most part, the Irish end of the Ansbacher Cayman operation was conducted as if the bank had a Dublin branch. At all times, not only were the records of transactions generated in Dublin, but the primary record was kept in Dublin and it was only after the creation of a record in Dublin that a copy was sent to Cayman. Although correspondence purporting to contain instructions from Cayman concerning its accounts either at Guinness & Mahon, Irish Intercontinental Bank or Bank of Ireland Private Banking, actually issued on notepaper containing the Ansbacher or, prior to that, Guinness Mahon Cayman Trust name and the address in the Cayman Islands, most such correspondence contained a stamped or printed direction having equal if not greater prominence than the name of Ansbacher, indicating that all correspondence with reference to any such instructions should be directed to 42 Fitzwilliam Square. From the documentation made available to the Tribunal and by information given to Tribunal by Mr. Padraig Collery and from officials of the various banks mentioned above, it would seem that they regularly corresponded with Mr. Traynor at 42 Fitzwilliam Square and what is more, that they took instructions either from him or from his secretary by telephone from 42 Fitzwilliam Square. The question, of course, will arise whether the banks dealing with Mr. Traynor were aware of this and, in particular, whether those banks dealing with the Ansbacher accounts were aware that the activities of the bank at least within this jurisdiction, were operated from 42 Fitzwilliam Square. It is a further question the extent to which those banks may have been aware of the true nature of the deposits and of the irregular manner in which they were being operated by Mr. Desmond Traynor. That the maintenance of secrecy and in particular with respect to potential scrutiny by taxation authorities was a high priority, if not the highest priority with Mr. Desmond Traynor and his associates in the Ansbacher operation appears from a document referred to in recent media reports as “a note to John Furze”. This document came to the notice of the Tribunal some considerable time ago well in advance of the media reports to which I have just referred. The contents of this document betray a commitment to secrecy which appears to be consistent with other documents made available to the Tribunal concerning the Ansbacher operation. The document was brought to the attention of the Tribunal as forming part of the personal papers of Mr. Kyran McLaughlin, a member of the firm of Davy Stockbrokers. The document was not brought to the attention of the Tribunal by any state agency, any state body, any authorised officer or any inspector. Mr. Kyran McLaughlin informed the Tribunal that he was not the author of the document and gave the Tribunal access to his other personal papers. From those papers, the Tribunal formed the impression that Mr. Raymond McLoughlin, Managing Director of Creans, may have been the author of the document. Mr. Raymond McLoughlin, when approached by the Tribunal, confirmed to the Tribunal that he was the author and has issued a public statement to that effect. The Tribunal is awaiting further information from Mr. Raymond McLaughlin concerning the circumstances in which the document came into existence. From the information available to the Tribunal to date, it would appear that the document consists of a note made by Mr. Raymond McLaughlin of a meeting he had in Guinness & Mahon with the late Mr. John Furze and the late Mr. Desmond Traynor. The note was created subsequent to the meeting and, while it raises a number of queries, it also contains information which was conveyed to Mr. McLoughlin by Mr. Furze at the meeting. It would appear from the information made available to the Tribunal that there is no connection between the Ansbacher operation and the offshore activities referred to in another document also mentioned in media reports concerning the Principality of Liechtenstein. The documentation made available to the Guinness & Mahon concerning the relationship between Guinness Mahon Cayman Trust and its Dublin parent included two documents from 1984 indicating a particular sensitivity on the part of the directors of the bank to scrutiny by investigatory agencies in the first instance in the context of drugs investigations, but in addition in the context of the potential for revenue scrutiny. “I enclose a copy of the above agreement which was concluded on the 26th plus a copy of the proposed legislation to effectuate such agreement. At a meeting with certain bankers last week the governor explained some of the background. The United States maintained previous gentlemen’s agreement was not working in practice and they were not content with it. If this agreement had not been concluded, they proposed to utilise to the fullest extent the subpoena weapon including the detention in the United States of the party served until he or she had given evidence. Obviously they intended as much harassment as possible. The UK was also presumably in favour of a narcotics agreement. Certain leading commercial banks had threatened to close their Cayman operations if the agreement was not concluded. They could not negotiate with the Attorney General of the United States except in good faith and obviously they did not wish to be seen as supporting the drug trade. It is intended that the party to be served for information, (the Assistor) in most cases will be the Chief Executive Officer of the firm. The US was adamant that the client was not told of the proceedings, hence the confidentiality imposed upon the Assistor for 90 days liable to extension. There was comment at the meeting surrounding worries of not even being able to tell head offices and of the notice being served on an individual rather than the company. The stand taken was this cannot be changed at the moment and head offices should be made aware of the procedures. Maybe as experience dictates how the agreement works in practice, the procedures could be modified in consultation with the United States. In practice, how it is really kept confidential within the office is a matter of doubt. Many would automatically know what is happening. The concession the Cayman Government obtained is that the evidence may be given locally and your lawyer may attend the “Star Chamber” with you. In practice all I think will delay any request to appear in the States. Procedures have evidently been established for monitoring by the Cayman Government of cases to satisfy themselves that the evidence obtained is used only for narcotics cases. However there obviously is a question mark about what happens if a narcotic case fails and the evidence has been adduced in open court. Is the I.R.S. precluded from using it? In theory, I suppose the answer is ‘yes’, but in practice if they know about it, maybe not directly but… Obviously this was the main concern of this being used as the thin end of the wedge but evidently the UK was firm no agreement for taxation matters and as I said in the beginning, the negotiations had to be in good faith. I gather there has already been some American press headlines in the order of ‘Cayman Secrecy Smashed’ and I expect business to be adversely affected. However the adverse press etc. depicting us as a drug island should now stop and the fact that we are the first haven to conclude an agreement may enhance our reputation as a clean island for reputable business. I have already, on the overhead monitor, indicated the report being given at the board meeting of Guinness & Mahon by Mr. Traynor in respect of the receipt of that letter. In addition to the back-to-back loans to Irish residents, there were also a series of substantial loans to US residents, secured by Cayman deposits in Guinness & Mahon in Dublin. These included loans made to Fernando Pruna and his wife Edulia Pruna of Miami, Florida. Between 1985 and 1988, loans were made to the Prunas which ultimately exceeded the sum of US $1 million. These customers were introduced to Guinness & Mahon Dublin by Guinness Mahon Cayman Trust and the facilities were secured by Guinness Mahon Cayman Trust deposits in Guinness & Mahon. Loans were also made to a company controlled by Mr. Pruna. It appears that Guinness & Mahon encountered considerable difficulties in securing interest payments during the currency of the loans. Ultimately, Guinness & Mahon took further security over property in Dade County, Florida. To perfect this security, the title to the property appears to have been transferred into the name of Mars Nominees Limited, the Guinness & Mahon nominee holding company. It appears that the balance due on this borrowing which amounted to US $700,000 was ultimately discharged in June of 1988 when it appears that the backing deposit of Guinness Mahon Cayman Trust was released to Guinness & Mahon. Following the discharge it appears that the property remained registered in the name of Mars Nominees Limited. In September 1988, a grand jury subpoena was issued in relation to documents held by Guinness Mahon Cayman Trust, Guinness & Mahon (Ireland) Limited and Mars Nominees Limited in relation to loans made to Fernando Pruna. Subsequently in March 1990, Letters Rogatory were issued by the United States District Judge of the Southern District of Florida for transmission to the judicial authorities in this country in relation to an investigation of alleged organised crime drug smuggling operation headed by Fernando Pruna. An indictment had been issued by the United States attorney charging Fernando Pruna and members of his organisation with crimes including operating and conspiring to operate continuing criminal enterprises dedicated to the importation of cocaine and marijuana into the United States from 1981 to 1988. On foot of the Letters Rogatory, an order was made by the High Court in Dublin on November 1990 that an official of Guinness & Mahon attend to be examined on oath. It is not yet clear as to what official of the bank attended for examination but from inquiries made by Tribunal with the United States Department of Justice, it would appear that Mr. Pruna was ultimately convicted of certain of the crimes with which he was charged and served a prison sentence in a United States Federal Penitentiary in Florida. MR. COUGHLAN: Perhaps we do, I should say the Tribunal is not suggesting Mr. Traynor, Mr. Furze, Mr. Collins were involved themselves in the drug trade or assisting the drug trade. The Tribunal is interested in the irregular and unorthodox banking methods used by them which facilitated this particular type of activities to allow money be effectively laundered. I should say that. CHAIRMAN: That distinction is important, yes. Very good, five to two.